I helped with e-mail design on several projects at our Enterprise E-Business group. 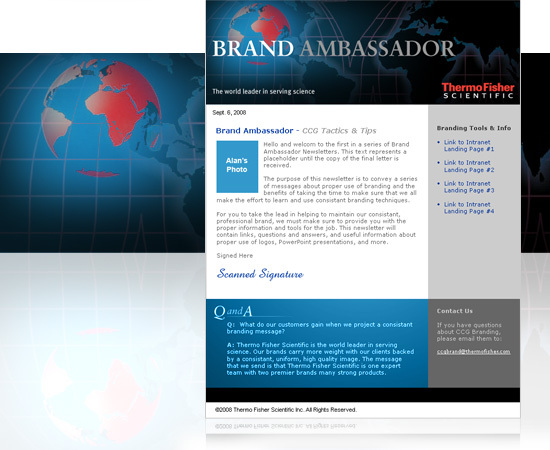 The sample to the left is a Brand Ambassador email template for ThermoFisher Scientific. Brand Ambassador went out once a week and contained branding rules, guidelines and tips for our internal customers. Our goal was to help ensure brand compliance and to teach internal users why protecting our brand helped to promote us as a company. I also created designs for each of the Fisher Scientific Markets and for CEO Newsletters.